That’s right… It’s time for the letter W in our vehicle alphabet series! 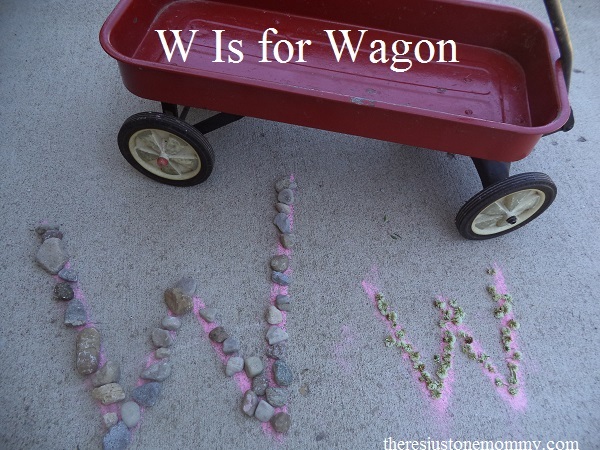 And when it comes to activities for the letter W, we just had to do W is for Wagon! With the beautiful weather we had, I planned for all outdoor activities for the letter W, although many of them could be modified and done indoors if needed. Then I asked the kids to use objects they found in nature to form the letters. They decided to use rocks from our driveway to form the upper-case W and handfuls of clover flowers to form the lower-case W.
Once they were finished they wanted to count the rocks and flowers. We went slowly so the preschooler could work on his one to one correspondence. They were surprised by how many more flowers the little W had versus the rocks in the big W! 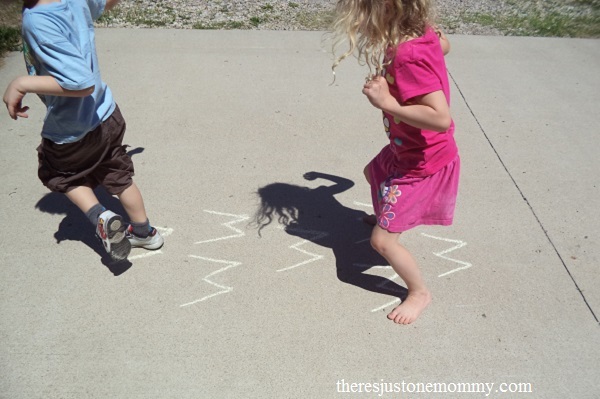 After writing their own W’s with sidewalk chalk (all over the front porch), it was time for some hop-scotch! Sometimes kids just have to move! My next activity for them was also physical. 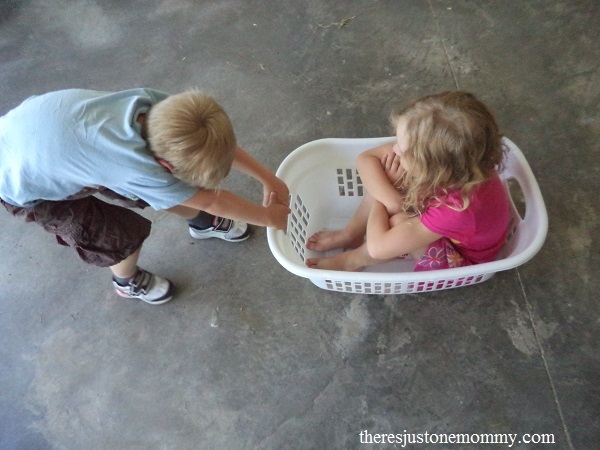 They took turns pulling each other in a clothes basket. Then we got out the little red wagon. Before I knew it they were zipping each other all over the place. We talked about why it was easier to pull each other in the wagon (wheels), and what wagons could be used for. Finally, it was time to fill that wagon up with things that start with the letter W.
I had a basket of objects from the house, some that start with W and some that don’t. They took turns pulling out each object, saying what it was, and deciding if it belonged in the wagon or not. Looking for ideas of things you might have around the house that start with W? 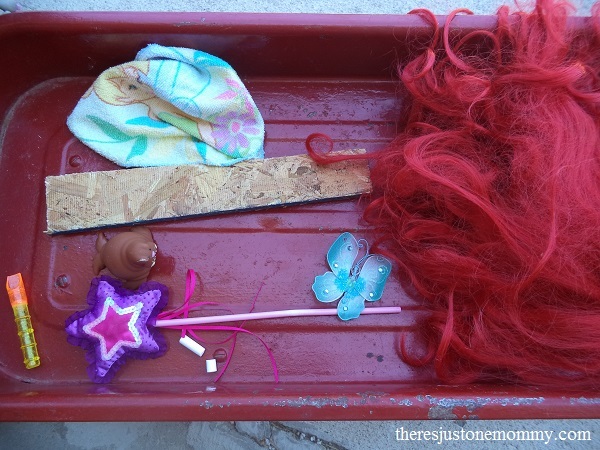 We had: a wig, walrus, wand, whistle, washcloth, piece of white chalk, wings, and a piece of wood. 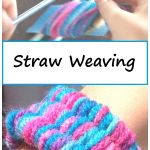 We had a wonderful time with our activities for the letter W.
Can you guess what we will be doing for the letter X? Thanks for the great ideas! 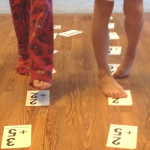 I pinned to my “teaching the letter w board”… ! Just stopping by from the Montessori Monday link up at Living Montessori now. 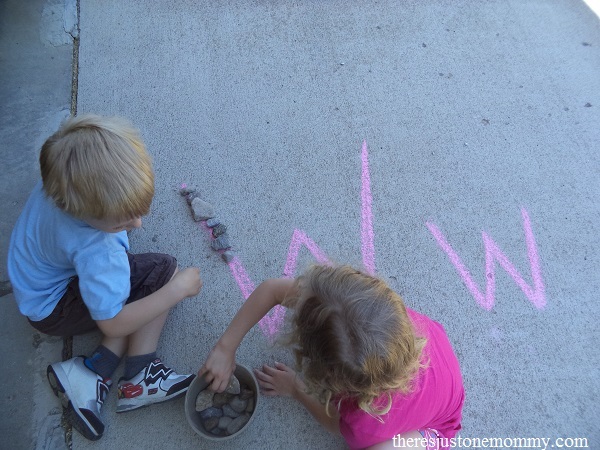 Your rocks on chalk remind me a little of the painting with water over chalk activity that I used to do with my learning to read/write kids. Thanks for sharing. 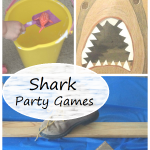 Painting with water is one of my favorites to let them do — mess free and tons of fun for the kids! 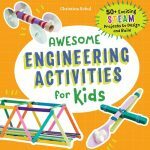 I’ve just pinned this-great ideas here!